One of the elements we reported on almost immediately was AMD’s decision to drop the suggested retail pricing of its current Ryzen desktop processors. Since the launch last year, Ryzen processors have varied quite dramatically from then to now: the processors started off at the launch pricing, but through the summer and into the winter, many retailers were offering discounts, without any catches. Throughout this time, AMD maintained that their launch-day pricing structure was still in place, and it was up to distributors and retailers to dictate the exact pricing, and as far as AMD was concerned, the price at which these processors were sold to distributors had not changed. This did not stop some of the media from speculating wildly in spite of AMD’s official line. If we line up a direct AMD vs. Intel with this new pricing, it is clear that there are a couple of battle grounds. The Ryzen 7 1800X, now at $349, squares up with the Core i7-7700K at $350, the previous generation high-end overclockable processor. The Ryzen 7 1700, our suggested mainstream AMD processor in 2017 is now $299, undercutting the Core i7-8700 while still having more cores. The Ryzen 5 1600 at $190 is now aligned with the Core i5-8400 at $187, and for this price the Ryzen 5 1600 offers simultaneous multi-threading whereas the Intel processor does not. Down at the low end are the new processors with Vega graphics, the Ryzen 5 2400G at $169 and the Ryzen 3 2200U at $99, which are priced against the Core i5-8400 at $187 and Core i3-8100 at $117 respectively. To put this into perspective, Intel used to publish its price list weekly, but after accidentally leaking the details of processors before launch, have migrated it to monthly (though they seem to have missed January?). Nonetheless, Intel rarely changes the suggested retail pricing of its mainstream processors. What is not mentioned in this table is which processors come with which coolers. AMD’s best-selling products come with variants of the Wraith cooler provided in box, which would be considered a separate cost on the Intel lineup. As part of the price drop announcement, AMD is introducing a new variant of their Wraith cooler family to system integrators. The Wraith PRISM will sit above the Wraith Max and Wraith Spire in the family, going above the Max with a rainbow LED ring instead of just a red one, and illuminated fan blades. AMD is citing enhanced motherboard compatibility for the LEDs, and it still uses the same mounting mechanism since AM2. There will be an overclockable fan profile, or a silent operation mode capable of 39 decibels. The only ‘downside’ to the cooler is that it will not be on general sale, or be bundled with any processors. In order to get one, it will be up to system integrators to use it and for users to buy a pre-built system. As a result, the cost will be up to the system integrator. Edit Feb 2nd: Apologies on my part, this paragraph is wrong. I had erroneously remembered what AMD had told us. It has since been clarified: AMD will be communicating its Wraith PRISM strategy later through Q1. The other element on cooler updates is a price drop for the Wraith Max. 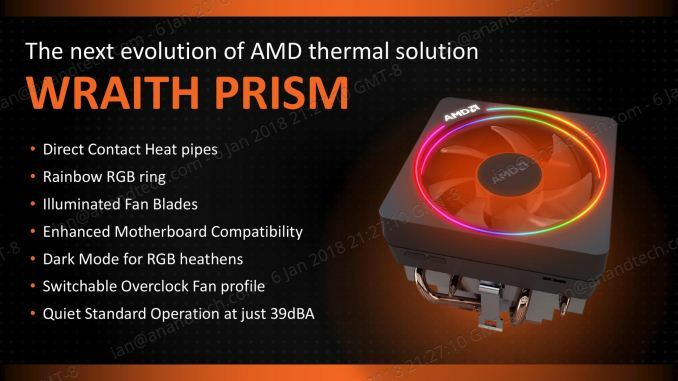 This is the one Wraith cooler that AMD does actually sell at retail, representing a 125W near-silent cooler with a shroud and a red LED ring around the fan. When AMD launched the cooler for $60 last year, a few of us baulked at the price: it’s a nice cooler to have, but it is not a $60 value. AMD is now going to have a suggested retail price of $45, which is more nearer the mark, but the cooler market is a competitive place for this sort of thing.